Has there ever been a movie out of Hollywood that has done more to put paddling on the map? 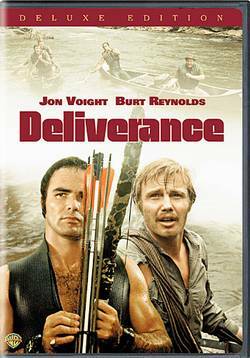 Deliverance, that iconic canoeing flick that put paddling and the Southeast on the nation’s radar for good, is celebrating its 40th anniversary this year, with the cinematic staying power of Hypalon…. “All of a sudden, America was captivated by whitewater rafting and canoeing,” says Sutton Bacon, president of Brycon City, N.C.’s Nantahala Outdoor Center, which was founded on the banks of the Nantahala River in 1972 in the same year as the movie’s release. Based on a novel by Georgia native James Dickey, the move stars a black neoprene-vest-clad Burt Reynolds, Ned Beatty and Jon Voight and follows their exploits canoeing the fictional Cahulawassee River, dodging rapids, hillbillies and gunshots along the way in a tale of wilderness and survival. In reality, the rivers used for the filming were the Tallulah Gorge and the Chattooga, which was added to the Wild and Scenic Rivers list in 1974 and is now one of the most popular whitewater runs in the region. According to USA Today, The Atlanta Journal Constitution reports that the film has helped create a $20 million rafting and outdoor sports industry along the Chattooga, which runs between Georgia and South Carolina. (NOC is now a $15 million a year business.) Several communities along the Chattooga, including Clayton, Ga., and Long Creek, S.C., held celebrations this year for the film’s anniversary, including the Chattooga River Festival. Regardless of people’s complaints of how the movie depicted locals, no one can argue that it didn’t put the area, and paddling, on the map. Several movies have been filmed in the area since “Deliverance,” including “Killing Season,” starrng Robert DeNiro and John Travolta. To be released in 2013.